The XE93 unlocks all the thrills the very latest picture technologies have to offer while also effortlessly taking yesterday's pictures to places they've seldom if ever been taken before. Leading the way is the second-generation of Sony's Slim Backlight Drive system, which uniquely places two LCD light plates in sequence to provide twice as much local light control as you get with typical edge-lit LCD TVs. This system is the only edge LED engine we've seen, in fact, that's capable of lighting a bright object in the centre of the image without causing stripes of light bleed right across the screen. The KD-55XE9305 also boasts Sony's latest and greatest picture processing engine. The X1 Extreme chipset (first seen on Sony's spectacular 65ZD9 flagship TV last summer) introduces a new dual database system for improving the way high definition sources are upscaled to 4K, and crucially carries enough processing horsepower to add support for the Dolby Vision high dynamic range (HDR) format via a future firmware update (Dolby Vision adds a layer of extra information to the HDR picture data to help TVs optimise the way they present it). This chipset also drives the advanced local dimming system made possible by the Slim Backlight Drive+; Sony's Triluminos colour engine for delivering a wider, more defined colour palette; and a rather brilliant feature called Super Bit Mapping that gets rid of the colour striping issues that can plague HDR playback with surprisingly many rival TVs. Is the XE93 the 4K telly to plump for, given the wide array of competition available from Samsung, Panasonic and LG? For better or, in our opinion, worse, the 55XE9305's smart features are all filtered through the clunky lens of Google's Android TV platform. The latest version of Android TV found here is at least less buggy and less sluggish than previous versions, but it still features a horribly over-powering home screen, still seems far more focused on app quantity than app quality, still fails to offer enough customisation, and still doesn't seem to understand that TV users generally have different priorities to phone users. Fortunately Sony has got round Android TV's additional issues with failing to cover all of the UK's big four catch-up TV platforms by adding the YouView platform to the Android TV mix. It's worth noting, too, that Sony seems to have developed its own relationships with Netflix and Amazon outside of the Android platform, ensuring that both apps support HDR and native 4K streams. At the time of writing the streamed HDR support only covers the industry standard HDR10 format, but presumably the XE93 be able to take advantage of Netflix and Amazons' Dolby Vision shows too once the aforementioned software update turns up. Sony's new TVs are also confirmed as supporting the new Hybrid Log Gamma (HLG) format that's expected to be widely used for HDR live broadcasting. The home for all the 55XE9305's cutting-edge technology is an exercise in elegance and minimalism. The screen has a super-thin black frame edged in a subtle champagne metallic trim, and this champagne tone is continued into an appealing and robust centrally-mounted desktop stand that also provides some very effective cable management. Connections fed by those cables are decently numerous, and include four HDMIs, three USBs and the now obligatory Ethernet port should you not want to use the built-in Wi-Fi instead. Upon letting the 55XE9305 loose on a few Ultra HD Blu-rays our first instinct was to reach for the sunglasses. Its HDR pictures really are phenomenally bright, driving HDR's peak white highlights and ultra-dynamic colours off the screen with a level of aggression only marginally bettered by two much more expensive TVs: Samsung's KS9500 series, and Sony's own ZD9 flagships. The expression this gives to HDR pictures, the volume it brings to the wide colour ranges that accompany almost all HDR images, and the way it enables the XE9305 to pick out subtle tone detailing even in the very brightest parts of the picture reminds you in no uncertain terms of just how important brightness is to the HDR experience. In fact, the 55XE9305 outperforms the ZD9 series when it comes to delivering detail in the brightest areas, due to some seemingly superior mapping of HDR's so-called PQ Curve. It's impressive to see, too, that the XE93 is capable of partnering its intense brightness with some unusually deep and believable blacks by edge-LED TV standards. The Slim Backlight Drive+ really does dodge much of the general greyness or overt light stripes usually associated with edge-lit LCD technology when it's asked to deliver a high-contrast HDR image. As OLED fans will attest, a full HDR effect requires good black levels too - and while the 55XE9305 is no match for OLED on the black level front, it's far ahead of the typical LCD game. It also delivers some quite beautiful colours. We've long been a fan of Sony's Triluminos system for the way it combines gloriously rich tones with extreme delicacy of tone and blend, and it's more effective than ever on the 55XE9305. All that brightness just makes it that much easier to see all the finesse and colour minutiae Sony's picture engine is able to eke out of Ultra HD's pristine, dynamic and ultra-detailed images. It's thrilling, too, to be able to watch HDR movies without having to worry about seeing the distracting stripes of colour in skies, clouds, swirls of smoke and underwater shots that crop up from time to time on pretty much every other brand of HDR TV - including Samsung's flagship models. The peerless finery of the 55XE9305's colours joins with some pin-sharp reproduction of native 4K source's resolution to deliver some of the crispest, cleanest-looking evidence yet for just what a difference 4K can make even on a 55-inch picture. What's more, the stunning clarity is scarcely so much as dented when there's motion and camera pans to handle. Even without calling into play Sony's Motionflow processing the image suffers only the tiniest bit with LCD's common motion blur and judder issues. If you want to remove even these faint traces of detail-reducing flaws, though, you can use Motionflow on its True Cinema or even Standard settings without it generating many unwanted side-effects or leaving the resulting image looking unnaturally fluid. While the 55XE9305 is quite literally made for 4K and HDR sources, it also goes further than most rivals to make sure you still get a great picture when you have to watch a standard dynamic range, non-4K source. By referring incoming HD images against separate detail enhancement and noise reduction databases it's able to create upscaled images that look not just more detailed but also more natural and solid than those of any rival 4K TV seen to date (bar Sony's own 65ZD9). Some of the 55XE9305's picture presets also apply an HDR upgrade to standard dynamic rage content. Some AV fans won't like the sound of this, but in truth the system is so effective that we would expect most users just to accept its benefits without question. Other HDR upgrading engines, particularly Samsung's HDR+ engine, push the added HDR effects more aggressively, but Sony's more restrained look means there's much less chance for skin tones to suddenly look unnatural, or certain lighting effects to get too much prominence. While the XE9305's pictures often look good enough to bring a tear to your eye, though, they are not perfect. Viewing angles are pretty tight for a start, with backlight flaws becoming much more strident and general contrast levels taking a hit if you watch from as little as 25-degrees off-axis. Even Sony's much-improved Slim Backlight System+, meanwhile, can't prevent you sometimes seeing pretty clear blooms of accidental light around extremely bright objects when they appear against a dark backdrop. To be fair, the extent of the backlight clouding surrounding streetlights, moons, candles and the like is reduced from Sony's debut Slim Backlight Drive sets, last year's XD9305. There's less abrupt edge definition to the backlight blooms too, making them less likely to draw your eye away from what you're actually supposed to be looking at. That said, high quality direct backlit LCD TV sets like the Samsung KS9500 or Sony ZD9 TVs suffer with markedly less overt blooming, while OLED TVs won't suffer with any blooming at all. Though no OLED TV will get close to the 55XE9305's brightness. One final smaller frustration with the 55XE9305's pictures is that they take a little longer to render than video game fans would like; around 38ms on average, though sometimes as long as 52ms. This isn't devastatingly bad - we've seen TVs take longer than 100ms to render images - but it could be enough to marginally undermine your performance with games that rely on split-second timing. Joining the 55XE9305's mostly outstanding pictures is a less effervescent but still potent and engaging sound performance. The seemingly invisible speakers bely the TV's slender dimensions by producing a large but coherent soundstage without misplacing or overwhelming vocals, and fill the wall of sound with plenty of harshness-free details. There's enough headroom in the mid-range to deliver a sense of expansion during action scenes too. Bass could reach deeper, but the sound seldom sounds unbalanced or thin. 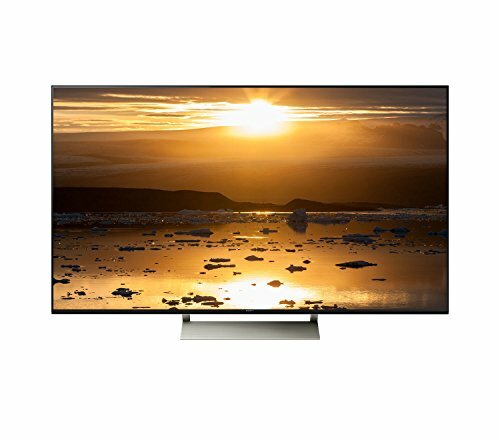 While not even its cutting-edge Backlight Drive technology can completely solve LCD's issues with controlling light with HDR content, the 55XE9305 nonetheless improves hugely in just about every way on the efforts of its 2016 predecessor. All for a price which, all things considered, seems more than fair. It's a strong contender for the 55-inch 4K TV to buy. We described the ZD9 as "the HDR master" when we reviewed it in 2016. It's a notch above the XE93 in this regard, but only available from 65-inches in size (and starting at £4,000). The UK's KS9500 is a curved screen for an all-encompassing view and improved viewing angles (it's flat screen in the US). It's also mighty bright, with HDR that, ignorning the ZD9 (above), is unrivalled.